following the manufacturer's instructions in using the ohmmeter, field coil tests can be made more quickly and accurately than by using a test lamp circuit. ARMATURE TEST. - There are two practical tests for locating shorts, opens, and grounds in armatures - the growler test and the bar-to-bar test. To test for short circuits, place the armature on the V-block of the growler and turn on the current. 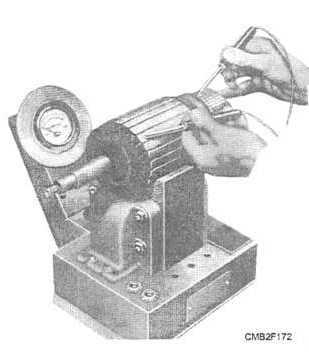 With a thin metal strip (hacksaw blade is good) held over the core, as shown in figure 2-17, rotate the armature slowly through a complete revolution. If a short is present, the steel strip will become magnetized and vibrate. 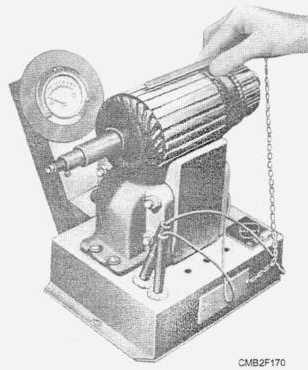 To find out whether the armature coils of the commutator are short-circuited, clean between the commutator segments and repeat the test. Should the thin metal strip still vibrate, the armature is short- circuited internally and must be replaced. Figure 2-17. - Using an armature growler. the contacts and read the milliammeter at the same time. The readings should be nearly the same for each pair of adjacent bars. 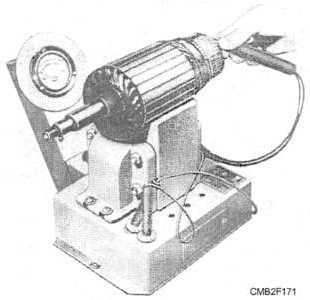 If a coil is short-circuited, the milliammeter reading will drop to almost zero. Figure 2-18. - Testing an armature for a short circuit with a milliammeter. Figure 2-19. - Testing an armature for grounds.